Please link back to Note Songs and see the amazing kitchens. As you can see I have plenty of morning sun coming in my windows. No valances yet. I have been going to sew new ones to match my cabinet background, but I went on vacation and just haven't got to them yet. Soon. Oh do you see another kitchen outside. That kitchen belongs to my sweetheart. He does all the canning and cooking Thanksgiving dinner outside. Someday I will take you on a tour of that kitchen. 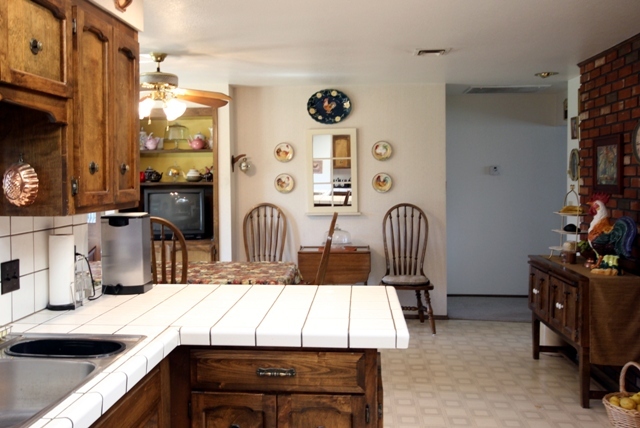 In 1975 we remodeled the original kitchen and built the existing cabinets. 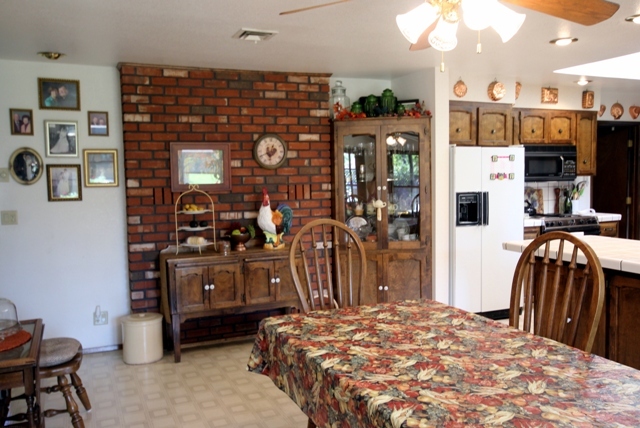 The kitchen was green and butcher block counters until 1990. 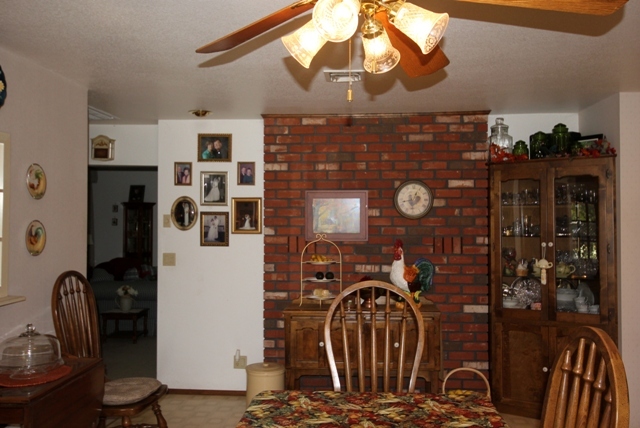 We remodeled again and installed tile and extended the dining room to the size it is now. Our table will seat 14 people and when I add the tea cart we have seating for 18 total. Yes! We have a BIG family. 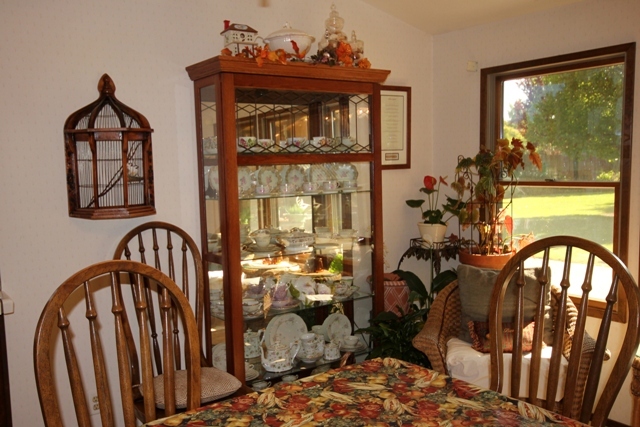 The china cabinet, buffet and cabinets were all handmade by a good friend who was a professional cabinet maker. And, I have been collecting copper molds for many years. The photographs on the wall are: my three children on their wedding day. My mother and father. My sweetheart's mother and father and our new 50th wedding anniversary photograph. I have lived in this home since 1969. This kitchen is the heart of our home. We live a casual lifestyle and love to cook and entertain our family and friends. 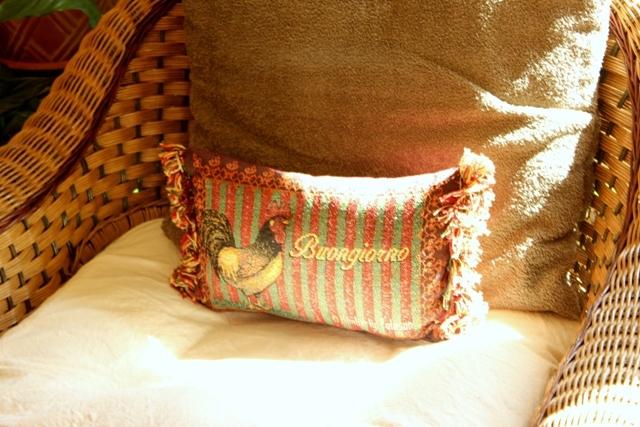 My Rooster creates a country feel in my kitchen and adds warmth and comfort too. I love him because he doesn't crow early in the morning and just stands there looking beautiful. How wonderful to seat everyone at one table. That's something DD2 complains about even though we have an open floor plan and can see the dining room from the breakfast room! I hope you'll drop by Atticmag to see our kitchens - it's a three for one! 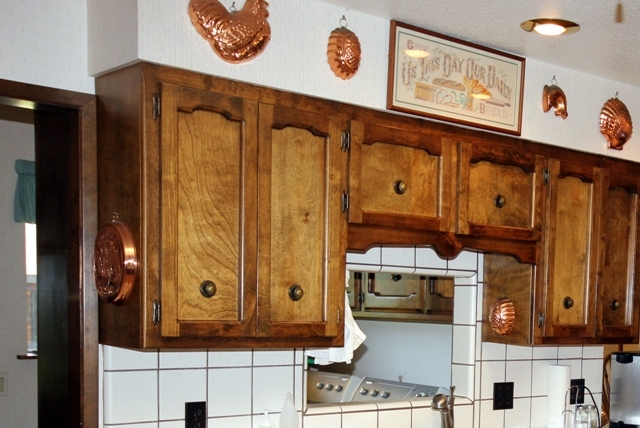 I love your cozy kitchen, especially the handmade cabinets. 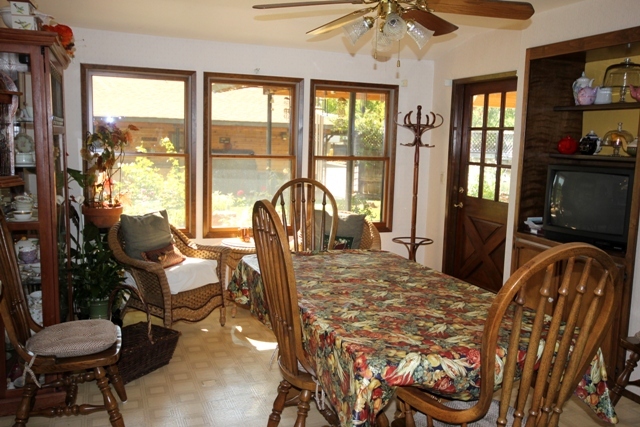 Hi Betty, what a great kitchen, it looks so warm and inviting! I'm going to check out the other links and I'll be back for cupcake Sunday (you might have to give me a reminder)anything with cupcakes has to be good! How nice that you can fit so many people at your table, a definite plus! 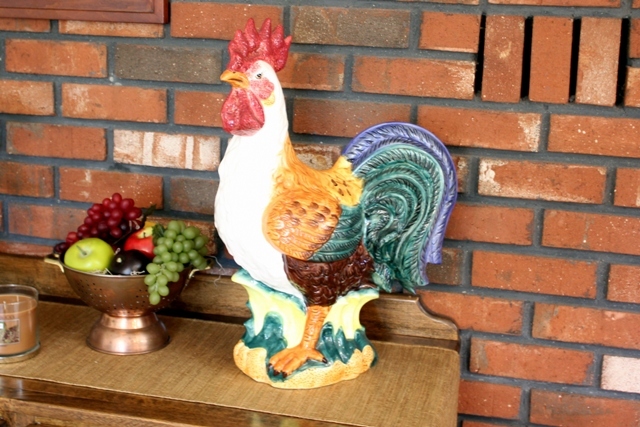 I like your pretty rooster against the brick wall, very cozy. What a great country kitchen! I love the brick. What a cozy kitchen...and I LOVE the red brick!! How fun to have such a large family and be able to seat them all to boot! 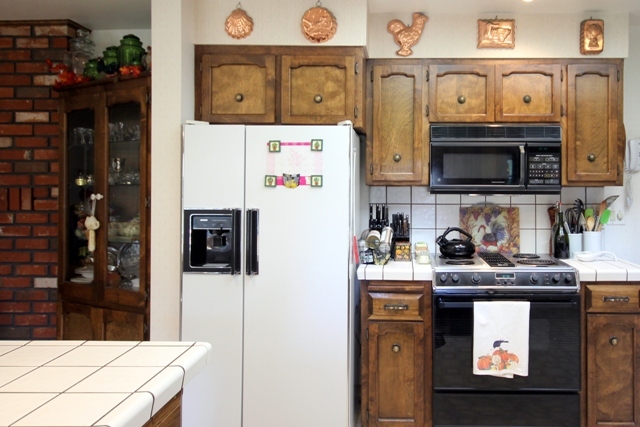 Your kitchen is lovely and sounds like a lot of wonderful memories have been made in or around it. Thank you for having us in today! What a nice and cozy kitchen you have.